Joshua Williamson Talks "Flash War" and Teases "The Consequences of 'Flashpoint'"
After more than six months of teases, writer Joshua Williamson delivers the first chapter of "Flash War" today, a storyline that will pit Barry Allen against Wally West with the future of the Flash family hanging in the balance -- more literally than you might think. The confrontation is being stoked by Zoom, Wally's greatest nemesis, but it quickly becomes clear that what Zoom wants is something that would benefit Wally -- and maybe the world -- greatly. 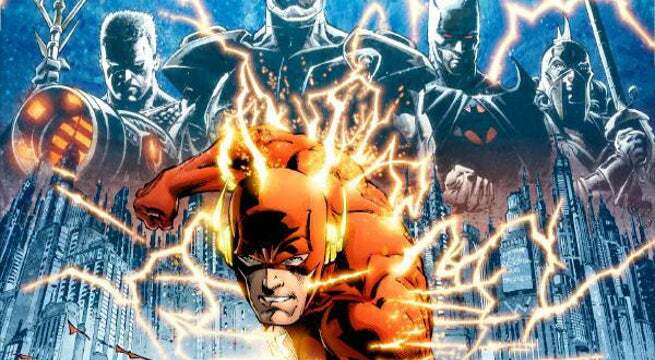 Barry, though, doesn't want to see Wally either team with the villains or mess with the timestream. So...what's next? Fight! Williamson joined ComicBook.com to talk about the "Flash War" storyline, which kicks off with today's The Flash #47. It feels like a really long time since we all found out that "Flash War" was happening, from your perspective, is it nice to finally be at the point where this is actually looming? Yeah. I started working on this story about two years ago; we were having a lot of conversations at the beginning of Rebirth. I started talking to other creators about this, and some editors, I think the week after Flash: Rebirth came out, the week before #1 came out, I was in the offices, and I said, "I have these thoughts on these ideas I want to do," and we started talking about them. It was early and we were just getting going with Rebirth. A lot of the ideas got tabled, but they were just ideas, they weren't story yet, that was a big part of it. Over the course of the year after that, I kept coming back around to it, and thinking about it, talking to my editor, and trying to find ways to get Wally in the book. Then at one point, all these ideas came together, and I had this moment where I was going for a walk actually, and I thought, "how do I frame this big story I want to tell, what is the piece that I'm missing?" Then I was like, "Oh Barry versus Wally, that's the part that's missing. But that's crazy, they'll never let me do that, this isn't gonna happen." But I went to them, and I start off by saying, "Listen, you're gonna think I'm crazy, you're not gonna want to do this, but I think it's the way to go. I want to do Barry versus Wally." We've never been able to do it before, there's never been a story like this, and of course they said, "What's the story?" Then I told them, this is what it's about, this is what happens. And then they said, "We love that, we're doing that, how does this work?" And then we started spending time talking about it, and then we announced it at New York, because we wanted to have a good runway, and because we knew the annual was coming out in January. I remember getting up on stage to announce it, and still having a little like, "This is not gonna happen," I kept coming back around to that thought of there's no way this story's gonna happen. Even now that I have a copy of issue-1 and I know it's coming out this week, there's still a part of me that still can't believe, but I'm so excited and really pumped up that after all this work and these conversations over the last two years, we're finally telling this story. I think it's interesting that we're on the two year anniversary this week of the beginning of DC Universe Rebirth, which is the return of Wally West, came out two years ago this week. And to be able to come back around to that story, and to come back doing this major Flash story, with Barry versus Wally in "Flash War" the same week, I think it's really awesome. In this week's issue, we finally get a really more meaty idea of what exactly is driving the "war." What can you tease in the run-up for people who are trying to figure out why these people are fighting? The best way to say it is this is a story that is dealing with the repercussions and the fallout of Flashpoint, the actions that Barry did during Flashpoint, and getting to move forward with Wally's story. If you've been questioning a lot of these things, and wondering where this stuff's going, this is the beginning of that, this is coming back around to those ideas of Barry dealing with the larger consequences for Flashpoint. For a lot of people it felt like once the New 52 happened, there was no blowback to Barry, that what happened in Flashpoint was consequences-free because of the nature of the reboot. As a writer, who's also a fan of these characters, is this a little of your trying to fix that so to speak, and help change that perception on the part of some fans? I don't know if I think too much of it in that aspect. I am a fan of these characters, I think that's really obvious with my writing of The Flash particularly, that I love the Flash and the Flash mythology and I know it really well, sometimes too well I think. But I think that I feel like there was a lot of story left on the table. Some of my favorite stories that DC has done have taken advantage of that, in a good way, you'll have these moments where someone will go back and look at the history books of DC, and they go and they dig and they find these little bits of story that you can play up, or little bits of things you can build on and work on the mythology. Some of my favorite DC stories come from that, so with this I just felt like I could look back at the Flash history, especially when I started working on the book and looking at, since we were doing so much stuff with the idea of pre-Flashpoint history, there's so much story left on the table, I want to play with in this story. But I needed to make sure that I had an actually story when it came down to using Wally; I couldn't just go to them and say, "I want to have Wally in a book just because." I had to have a story for it, so at some point I was able to look at all the stories that were left on the table and build a new story. That's what I want to do, I don't want to break a story, I don't want to take a story that somebody else has done and destroy it and break it down, I just want to build by continuing to build on these stories, build on the mythology of these characters. It seems like DC is pretty committed to Barry for the long haul, so is there any concern on your part that you'll be alienating the pro-Wally segment of the audience by explicitly pitting them against each other? I never worry about that. I'm a Wally guy too, I grew up with Wally, Wally was my Flash, and Barry was always remembered in flashbacks. He was remembered a certain specific way, you never speak ill of the dead, so Barry was always propped up as the perfect hero, he was the one who sacrificed himself to save the Multiverse. He's perfection. So throughout Wally's run, I think he was written a certain way whenever they do flashbacks, and then that eventually bled out into how he was written in books that weren't flashbacks. You look at The Brave and the Bold or JLA: Year One, both by Mark Waid, the way that Flash was written those stories, he was written the way Wally remembered him. But if you go back and you read all those older stories with Barry, you find that he was a flawed character, he was someone who had these challenges and made mistakes and bad choices, and sometimes would let certain things slide and would be obsessed with certain things. When Geoff brought him back, I think Geoff tapped into a lot of that, Geoff was able to find a way to tap into the flaws that Barry had. You look at the stuff he did during Rebirth, and you look at the stuff during Brightest Day, and you can tell that Geoff was starting to tap into those, showing you that Barry was not perfect. Which was a lesson that Wally had to learn too, because Wally was always trapped in his shadow. Now, to get to your question, I feel like it was important to me that both characters were presented in a way that fans would be happy with both interpretations of these characters, and understand this conflict, but in a way where you were just super invested in the story and super invested in these characters to where you would not feel alienated. If you're a really big Wally fan going into the story, you're gonna get what you want from a Wally story. If you're going into the story and you're a Barry fan, you're gonna get what you want from it from a Barry story. And you're going to have this conflict between these characters, that all being said, I feel like one of the most important things you can have in your book is for people to be invested to talk about it, speculate, to feel. If they're having a conflict and they're talking about the book, I think that's a win, if they start not talking about the book because they're that alienated, that's a problem. But I don't think that's what's gonna happen here, I went in and I looked at it, and I tried to think about it from the character's perspective. And for someone like me, who when I was a kid being very into Wally, and actually during Mark Waid's run I was super into Bart because I was a teenager, I was a similar age to him, I was a hyper kid, so I was super into Bart. Then you got to when Geoff was writing Wally, I was very into Wally because I was the same age as him, I was in my 20s. Now with Barry's character who's in his late 20s, early 30s, we fudge dates around, I'm very related to Barry. And I've been writing Barry for two and a half years now, at least from my end, the book's been coming out for almost two years, and the first time the conversation started of me writing the Flash book was three years ago. In my head, I've had this character, I've had Barry in there, and I feel like I have bonded with him more so than I've ever bonded with a character. To me, being a fan of both, I make sure that both parts of me, the fan that was like ride or die with Wally ten years ago, that fan, that me would be happy here. But then also, the Barry fan that I am now that is connected with the character now, is still happy. All that stuff's really important to me, to push this book forward and make sure it's real. The best conflicts are when you can see both sides, and both sides can relate and see the other side, so I wanted to make sure that was something we were doing here with this book. If fans are talking about it, and they're getting a little worked up, I feel like that's a good thing. I don't want anybody to be angry of course, but I feel like it's good to let people, it's fun to me. It's fun to have that kind of energy with the book. Obviously this issue, because this week we see Zoom return. In the annual where you've revealed Zoom as the mastermind behind this whole thing, we also saw Bart, we saw Max Mercury...how deep into the mythology are you going to be digging during "Flash War?" That's a tough question, I can't really answer that too much, there are certain conversations we have, and I will say this, it always comes down to story. It's the same with the Wally thing, you can't just be like, "I don't want to use this character." Okay, why, what is this story? This is a writing thing too, if a story can exist without a character, that means that character isn't necessary to the story. 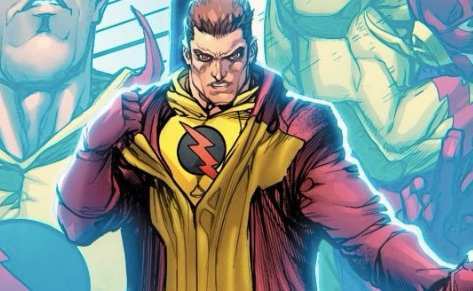 For me, with digging into Flash mythology, I go deep, obviously I'm a big Flash fan so I'm always trying to find ways to get as much of the mythology in there as I can. It's also fun to me, I love the Flash mythology and there's so much about it that I want to share and do, bring back into the book. It's really a matter, with "Flash War" you're gonna see a lot of stuff, there will be a lot of stuff seen, you see some of it in this first issue in #47, we tease a lot of different things. In terms of the bigger picture, it's really always the matter of what story you have. I don't think there's anything blocking us, it's just a matter if you have the right story for this. I just want to get as much stuff in there as I can too, I love the Flash mythology, and I feel like "Flash War" is really the beginning of a big Flash story, but also the beginning of a lot of DCU stories that spin out of this. There will be a lot of things that will come out of "Flash War" that we will be picking up on way later, other books are gonna pick up on, you're gonna be able to see this big tapestry that's at play, and there will be a lot of stuff that will be teased, and there'll be a lot of story that's presented, and a lot of things that make you go, "What is that, when is that happening, what is this over here?" During "Flash War," because it really is the beginning of a big story. How does some of that work to influence the story? Because you said "Flash War" is part of one of your early pitches, and this has been percolating for a really long time, but obviously the impetus behind "Flash War," or at least part of it, is the events that took place when the Source Wall was damaged in Metal. How do those plans evolve when you realize, "Wait, there's opportunity here?" It's just a lot of conversation. Scott [Snyder] and I talk pretty frequently, James [Tynion IV] and I talk almost every day, Tom [King] and I talk pretty frequently, a lot of us creatives talk to each other, and we see each other at conventions, and we're friends. There's a lot of sharing with each other, and then like, "Hey I'm gonna do this, you're gonna do this." And then sometimes you tell your editor a story idea, and then your editor tells the other editor, it's like a network. The editor will be like, "they're doing this over here, we should see if we can tie into that." Even something with, there's a new Teen Titans series that started with Adam Glass, months ago he called me and was like, "Here's what I'm thinking about doing in Teen Titans," I'm like, "Alright cool, let me give you the down low on what's coming in Flash, what's coming in No Justice, what I'm doing with Kid Flash, here's my thoughts on these things. Here's the pieces and here's where these characters are gonna be at emotionally, do you want to play with that?" And he was like, "Yes, I want to do this, this and this." I will find ways to foreshadow or find ways to tease what you were doing in my book, and it's a lot of talking, and a lot of just going back and forth. Sometimes your editor will play matchmaker and be like, "Hey do you know this creator? You should talk to them really quickly, the next convention you're both at you should just share ideas with each other." Then you do that, and then a lot of cool stuff comes out of it. It's fun, I think it's one of my favorite parts of the job to be honest, being able to talk with other creators. Because we work on the Universe, we work on our individual books, I work on The Flash and Justice League Odyssey, but I also worked on Metal, and I worked on No Justice, I've worked on a lot of crossover stuff the last couple of years. Because I worked on, when Flash: Rebirth was going, it's the beginning of all this Flash stuff, all the Rebirth stuff, I was in the conversations about a lot of that. And then Justice League vs. Suicide Squad, when Justice League vs. Suicide Squad was ending, I was brought in to talk about "The Button," and when "The Button" was ending, I was brought in to talk about Metal. And then when Metal was ending, I was brought in to talk about No Justice. There's this thing that keeps bouncing into it, but it's one of my favorite parts of the job. Working on our books, but also working on the DC Universe, I love it. I love the idea that this thing that I love, the DC Universe, being able to find ways to make it feel like a universe, not just individual books, and find places to do that. It's absolutely one of my favorite things. I think right now, we have a lot of people who are talking to each other, where that can happen, you have me and Tom and James and Scott, and now Ben is coming in, all of us are able to talk with each other and share ideas and try to continue to build on this great universe that we all love. How does Iris play into this story? She's definitely the matriarch of the Flash family, I think that's fair to say. She's really important to all of them, it's one of the uniting factors of all these characters, is their relationships with her. They all know each other, but they all knew each other with her first. Wally, both Wallys knew her first before they became Kid Flash, and then Flash, and then Barry knew her before he became the Flash, before he knew any of this stuff. So she is like the glue in the middle, I always feel like Barry is hope, and she's the truth, she is the truth of the Flash family. Being a reporter and being obsessed with those ideas, if you go back and look at her history as a character, you can go back and read, there's a book she wrote way back during Mark Waid's run, Wally found a book that was the history of The Flash that Iris wrote. DC actually published it, they published her book. I feel like that book, if anyone really gets to want a insight into my mind when it comes to the Flash family, reading that book will get you far. I think there's a lot of stuff in that book that's really interesting to pull from, and really interesting to explore. I think the way Iris is presented in that book, maybe it's because it's all told from her POV, it's her experiences amongst the Flash family, I think it's the best interpretation of Iris. So whenever I'm writing, I go back and I look at that book, because it's really insight. It's funny, because a bunch of editors and Mark Waid wrote that book, but that book is really insightful as to her character and the way she feels about a lot of things. So when I'm writing her, I think back to that book a lot, because it is her words, her POV, I think back to that. Now that she's in the book again regularly, because after she killed Eobard Thawne in #27, she was gone for twelve issues. It's interesting, one of things we talked about was we wanted her and Barry to have this falling out, and she wasn't gonna be in the book for 12 whole issues. And part of my argument for and against that, we were going back and forth on it, was back during Geoff's run, at the end of "Ignition," Linda left Wally. And then she wasn't back in the book for almost a year, she wasn't back in the book for a while, it took a few issues for her to come back in. I wanted to do that again with Iris, where I wanted to pull her out of the book for a while, build up this idea of her in the story with her and what Barry was going through, now that she's back in the book, she'll be in the book very regularly. We're gonna have issues where it's gonna be from her POV, again telling her interpretation of a lot of these things that are happening. Not getting into too many spoilers, but there's some stuff that's gonna be very tied into that book after "Flash War."